The Ravens have become a weekly must start defense at this point, and they're definitely a top play this week. 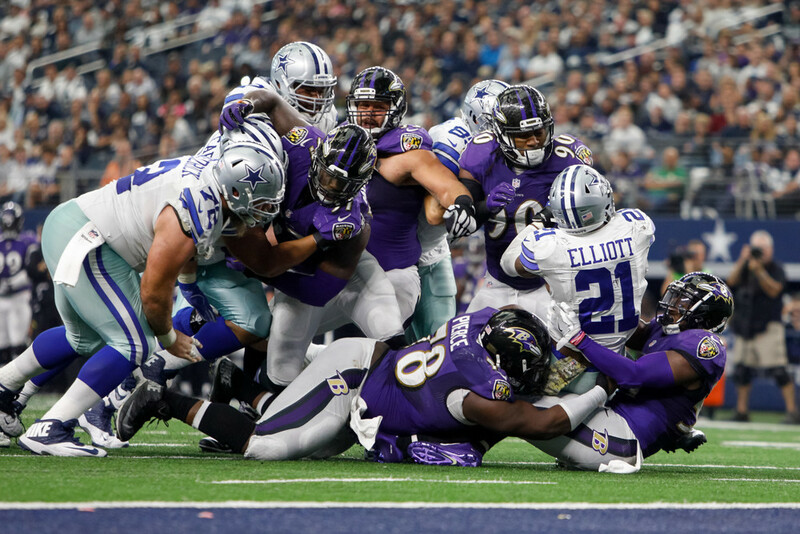 Baltimore remains one of the strongest home field advantages in football, and the Ravens crowd should be roaring on Monday night in primetime against an overmatched Tom Savage. The Texans have allowed the second most sacks in football, so Baltimore's pass rush should soar, and there are sure to be a few mistakes and turnovers too. Baltimore has had a couple monster fantasy games already this season. This could be the sort of play that saves your fantasy week on Monday night. This one is not particularly difficult to understand. The Eagles are really good. The Bears are really bad. Mitchell Trubisky has not found his way at quarterback for Chicago yet, and this team is basically a one man offense built around Jordan Howard. If the Eagles get the offense going early like usual, they'll take that weapon away and force Chicago to throw a lot, and that could spell disaster. Expect plenty of sack and turnover opportunities for the Eagles and maybe a chance for a big special teams play too. The Packers were just shut out at Lambeau Field for the first time since early in Brett Favre's career. Now the hit the road against an impossible Steelers defense, and it could get ugly on Sunday night. Green Bay's offensive line is struggling and bogged down with all sorts of injuries, and the Steelers should cause all sorts of problems. The Packers once vaunted offense has allowed among the top ten points to opposing fantasy defenses, and that is trending in the wrong direction. Pittsburgh should roll. When in doubt, always feel free to start just about any fantasy defense against the Browns. Cleveland is 0-10 now and sure, they may be mathematically alive for the playoffs, but the actual odds of them getting there are about as good as them ever finding a quarterback to do it. Cleveland leads the NFL in turnovers and is bottom five in points scored. That makes any defense look good, and the Bengals are actually an above average squad. They should put up points for you this week. If you're scrounging the waiver wire for an option at defense this week, you might consider turning to the Tennessee Titans. Tennessee's defense is not so good, so they're probably going to give up a few points. But no offense in football has made as many mistakes this season as the Indianapolis Colts. They've allowed the most sacks in football and have already allowed opponents to tally an embarrassing six defensive touchdowns. All of that adds up to the most fantasy points allowed to opponents, and even Tennessee should be able to take advantage of that.